The United States has launched a series of attacks by unmanned drones on the Somali Islamist group al-Shabab, local residents say. At least three targets were hit around Kismayo, the southern port which is under the control of the militants. 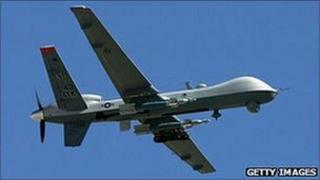 One reconnaissance drone is reported to have crashed. Meanwhile, there have been clashes between Somali government troops and the militants in the Gedo region, further north. Residents of Kismayo say there were explosions around the city, with at least three targets being hit. It is reported that al-Shabab are patrolling the streets, preventing locals from using the hospital, which is treating their wounded. Kismayo is a key asset for the militants, allowing supplies to reach areas under their control and providing taxes for their operations. In the Gedo region, there has been fighting around the town of Garbahare between al-Shabaab and government troops backed by local militia. A local MP, Mahmood Sayid, told the BBC that 120,000 people had fled to the town to escape the famine, but that there was nothing to give them. Deaths are being recorded every day, he said.